When GonzoToday Poetry Editor Ron Whitehead told us art legend and Hunter S. Thompson illustrator Ralph Steadman had agreed to create the official GonzoToday logo in his studio all of the staff and family of GT went stark raving mad. When we actually received the artwork this morning we were too stupefied to say much of anything at all other than a few grunts, sobs and wails of joy. It was beautiful, terribly confusing and the best New Years gift that had ever been given. 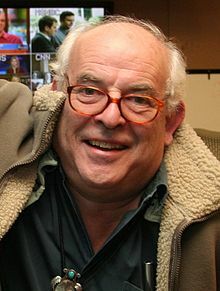 Ralph Steadman, born May 15, 1936 in Cheshire and raised in North Wales, is a world renowned cartoonist, illustrator and artist- made most famous by his work with Hunter S. Thompson to illustrate many of his greatest works including The Kentucky Derby is Decadent and Depraved, Fear and Loathing in Las Vegas, Curse of Lono and more. Steadman has also illustrated novels including the George Orwell classic, Animal Farm. Much debate has been had back and forth about whether Hunter S. Thompson’s fame came largely due to Ralph’s iconic work, or whether just the opposite is true. Perhaps Hunter’s famed writing granted credibility and public and professional legitimacy to Ralph’s wildly unique and visionary techniques. One thing can be sure, the two are inseparable- and between them there was a magic and synergy that might never be replicated. While both stand quite tall on their own, for those of us who were inspired, terrified or shamefully excited by those ‘goddamned cartoons’ we saw on those yellowed pages of Fear and Loathing in Las Vegas or the Kentucky piece, it is beyond a mere honor to have the same artist who gave Gonzo its image now impart to us his own vision of GonzoToday with an image of our own!